Minoru: Memory of Exile is a 1992 film directed by Michael Fukushima son of, Minoru Fukushima, a Japanese Canadian who was affected by the events of Pearl Harbor. It is a narrative of a Canadian born individual who was exiled into detention camps of British Colombia and eventually deported to Japan, a land “which he only knew by name”. Memory of Exile is an individual’s personal account of the hardship faced by Japanese Canadians who knew of no other home than Canada. The film is a portrayal of hurt and suffering faced by rejection and discrimination based on ethic discrimination. 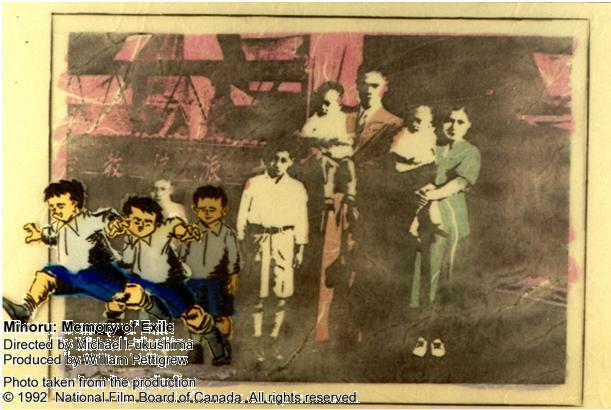 The National Film Board of Canada describes the film as a combination of Minoru’s memories and Michael’s voice “weaving a tale of suffering and survival, of a birthright lost and recovered.” To access the video visithttp://www3.nfb.ca/acrosscultures/toutvoir_vis.php?mediaid=665904&full.